A cracking start to 2017! Well this summer has been a pretty outstanding one for our tours and for mega-vagrants. The amazing thing is that all of the vagrants have been twitchable, it really has been a rather interesting season. First up was a Wilson’s phalarope in Napier in November, then a laughing gull (NZ’s first record) near Opotoki in late December, and then an Asiatic dowitcher at Motueka in late December. This has all been capped by the New Zealand mainland’s first record of red-footed booby at Muriwai in January. All birds have been long staying and allowed birders from all over the country to visit and see them – including both the Wilson’s phalarope and red-footed booby being added to Wrybill Birding Tours, NZ trip lists! 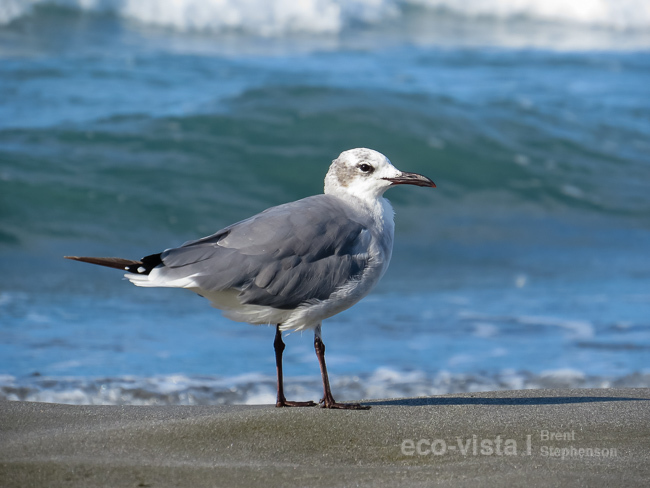 Laughing gull, New Zealand’s first record of this species, standing on Waiotahi Beach near Opotiki. 10 Jan 2017. Sav is currently finishing the last couple of days of our last 21-day tour for the season, with a great pelagic out of Stewart Island netting great views of mottled petrel, grey-backed storm-petrel, and all three penguin species (yellow-eyed, Fiordland and little), as well as good numbers of other seabirds. Checklists and tour reports will go up onto the Trip Reports page in the next few weeks, so take a look there in due course. Our tours for next season are filling well, with just a few available spaces currently remaining on Nov/Dec 2017 departures, and we have just opened up space on a February 2018 departure. So check out our 21-day tour dates.